Sam's handmade cards: #4 of my entry for september's challenge on CC uk. #4 of my entry for september's challenge on CC uk. Well I have made another card which I am proud of. 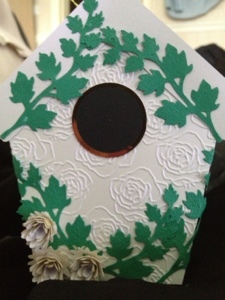 I have used a bird house template from creative crafting world.I used Snow White pearlised card and cut the shapes out and I used the 8x8 rose garden embossilicious folder on the front and back of the 3d bird house. I then used a circle punch for the gold mirri and black card. I then used coordinations green card and cut out the ivy from the die'sire die. And I added some yellow flowers using yellow pearlised card. I stuck it all down with the collall tacky glue. I am entering this into the crafters companion UK September challenge blog. This is stunning, I love the embossed background and the gorgeous flowers. What a super idea - great shape and embossing, great card. this is very lovely Sam, great idea. I really thought it was a bird house! Such a realistic card. Thanks so much for playing with us at Crafter's Companion!